A Bernie-Recommended Guide For Taking Our Revolution Into Local Politics--and Winning! 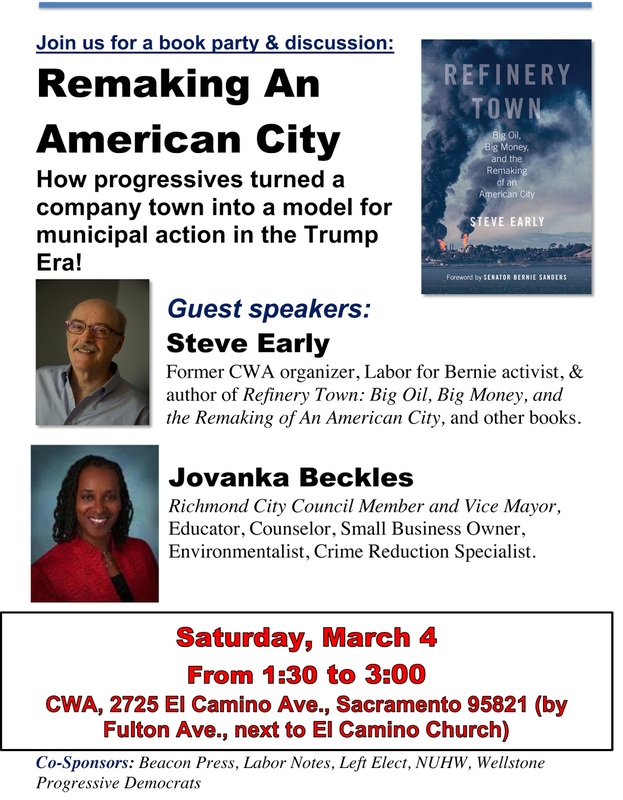 One of the many labor-backed local groups now affiliated with Our Revolution is the Richmond Progressive Alliance (RPA), subject of a new Beacon Press book by former CWA organizer and Labor for Bernie volunteer Steve Early. Steve's account of the electoral success of RPA candidates in blue-collar Richmond, CA is called "Refinery Town: Big Oil, Big Money, and the Remaking of an American City." Since 2004, RPA candidates have won 10 out of 16 races for mayor or city council against corporate-backed Democrats. 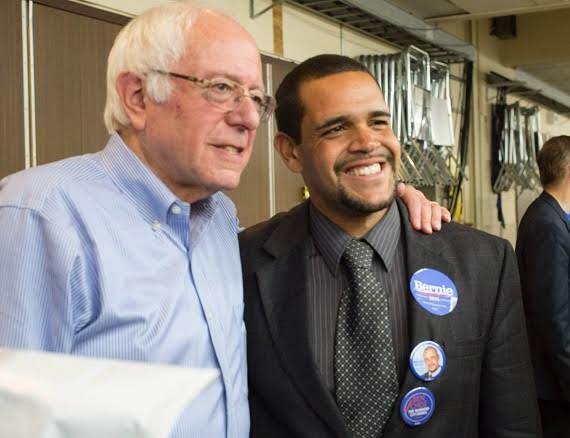 Richmond progressives now have a five-member super-majority on the Richmond council, which includes 26-year old Melvin Willis, a rent control campaign organizer pictured with Bernie at right. Melvin finished first in a field of nine candidates last November. He is now helping to implement rent regulation, a roll-back of recent rent hikes affecting thousands of Richmond tenants, and new legal protection against their being evicted without just cause. "These inspiring victories in Richmond would not have been possible without the prior development of a multi-issue, multi-racial progressive organization. Our country obviously needs a great deal of change at the state and federal levels. But laying a solid local foundation, like activists in Richmond have done, is an important first step toward overcoming working-class alienation from politics and resulting low voter-turnout rates." For more information on the lessons of successful labor-community organizing in Richmond, you can order Steve's book directly from the publisher. Steve and former CWA president Larry Cohen recently discussed the RPA and Our Revolution's strategy for building local organization at a bookstore event in Washington, DC. Click here to watch it on C-Span Book-TV. Hundreds of Labor for Bernie supporters have already attended book parties and forums with Steve in dozens of major US cities. For more information on upcoming events where Sanderscampaign veterans will be meeting and discussing Refinery Town in Sacramento, Chicago, Minneapolis-St Paul, Portland, Seattle, and other cities click here.